First up this week, Anne gave this dresser a quick and fresh restyle using 'Patina' from our van Gogh paint line. A bit of heavy distressing and this piece is cottage cool - looks great Anne! I love the mix of old and new here with the distressed paint and the new crystal hardware! Next up this week is a beautiful restyled buffet. Janice used 'Chalk' from our van Gogh paint line to brighten up this little number . . .
Last up this week but certainly not least is this beautiful jam cuppboard restyled by Sherri Ann using 'Cranberry' from our Fusion paint line - and it looks fantastic! Check out that cute rustic hand made sign on top too! Sherri Ann made that sign at one of our Fusion workshops and also gained the confidence to go home and tackle bigger projects - like this great looking cupboard! The black finishing wax really enriches the look of this piece and she even painted out the inside! OMG the sun is shining and it feels almost like summer outside!!! Wooh Hooh!! How nice is that?! Sunshine and warm weather just makes me want to freshen things up with paint, lol, is that just me?? We have some AMAZING restyles to share with you this week! Let's take a look at what'cha been workin' on, shall we? That's right my friends, you can just go ahead and paint your piano! Shelby did it and so can you! Doesn't this look great?!? Shelby use 'Patina' from our van Gogh paint line to give this piece a beautiful new look! We have done a couple piano's at the studio over the years and we have one in the queue that we are working on right now too! So this customer restyle came up at just the right time - so glad we can share it with you! Thanks for sharing your project with us Shelby! Here's a look at the piano 'before', can you believe this was a Kijiji find? Next up this week is another gorgeous restyle - this one using our Fusion Mineral paint line. 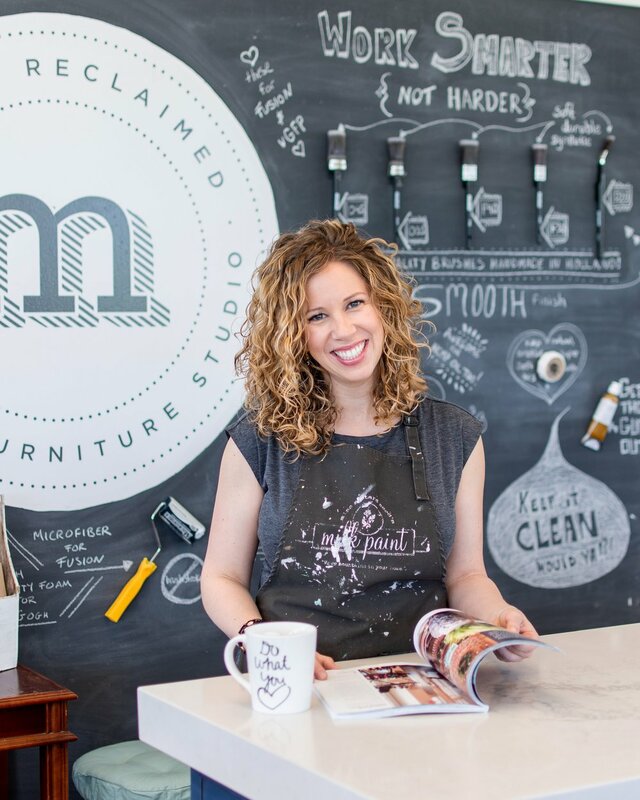 Tracy is no stranger to restyling furniture and has been featured on our blog a few times already - but this one is just. absolutely. stunning! Thank you so much for sharing this Tracy - it looks fantastic! Can't wait to see what you do next! 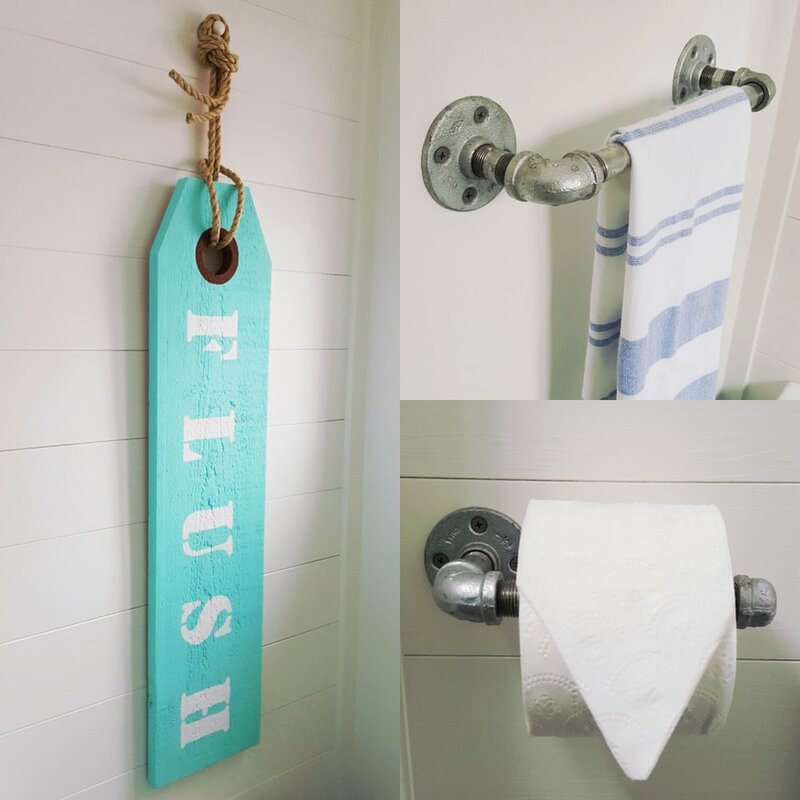 Next up this week is an awesome bathroom refresh by Monika . . . I can't believe I haven't shared this yet!! 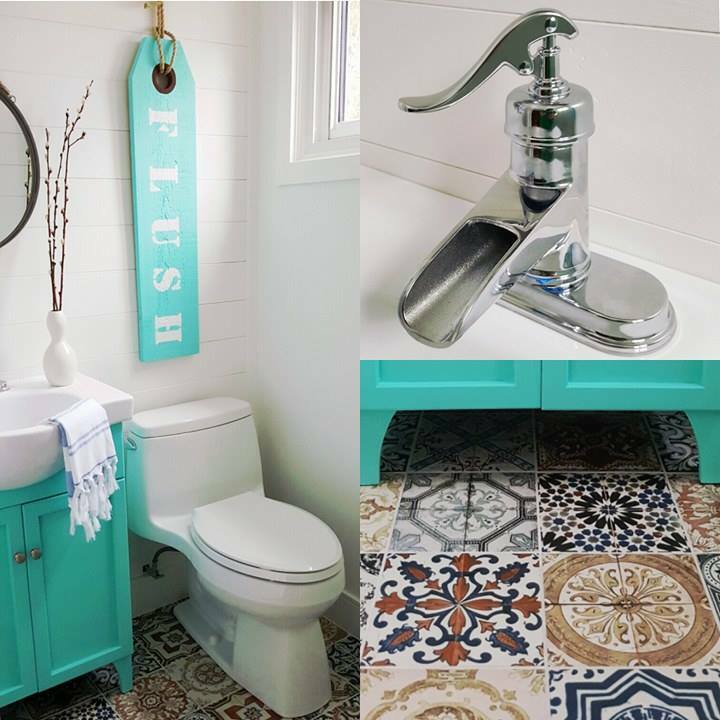 Monika used 'van Gogh' blue from our van Gogh paint line to give this refreshed bathroom a beautiful pop of colour and I just LOVE it! We don't have any 'before' pictures of this one, but Monika says the vanity was a dark brown basic one from Home Depot and the 'flush' sign she custom made. Awesome! The blue really adds a pretty punch to the room . . .and don't even get me started on how much I love the floor tile! Great job Monika - thanks for sharing!! Let's take a look at what'cha been workin' on - shall we? First up this week is a beautifully restyled cabinet by Tracy! I mean seriously, how cute is this? Tracy used our Fusion Mineral paint in Inglenook and Casement to give this little cabinet a whole new look! Not only is it adorable, it's a serious upgrade from how it looked before!! Next up is this sweet chair restyle by Heather. It looks great in a soft grey and check out that new pretty fabric too! Hard to believe someone was going to throw this chair away!! Beautiful job Heather! Thanks for sharing! Here is a sweet coffee table restyled by Marlene. This table was restyled in our van Gogh Fossil paint in 'Patina' . . . looks like she had some fun restyling some mason jars too! Looks great Marlene! Thanks for sharing! While we're talking about 'Patina', here's another great restyle in that same colour . . . Melanie gave this cabinet a whole new softer look. Beautiful job - thank you for sharing with us! Holy molay - summer is flying by! This dresser got it's great new look from 'Patina' a favourite colour of mine (and many others) from our van Gogh paint line. I truly believe that this soft blue-green colour belongs in any cottage anywhere, any day of the week! It's cottage colour perfection, lol! Great job on the restyle Marlene - thank you for sharing with us! Speaking of cottages . . . wouldn't this antique painted bed be perfect in a cottage guest room? Gail restyled this bed using 'Mascara' a slate grey/black from our van Gogh paint line - and it looks fantastic! Don't get me wrong - the bed itself has great lines . . . but painted out it just looks amazing! Good decision Gail! I think we've created another van Gogh fossil paint addict - sorry Gail! Good news is that your next purchase is 10% off, lol! Thanks so much for sharing your beautiful projects with us!